For my Stash Bee June Block, I created appliqué butterflies using Reemay. Here's a closer look into the process. Reemay is a non-woven material that doesn't fray and looks like a denser drier sheet. It can be used to create detailed shapes for raw-edge, fused appliqué. I place Reemay on the waxy side of freezer paper and coat it with inexpensive acrylic paint from my local craft store. Since Reemay is highly absorbent, it takes a decent amount of paint to get it completely coated. After the paint dries completely, I peel it off the freezer paper. 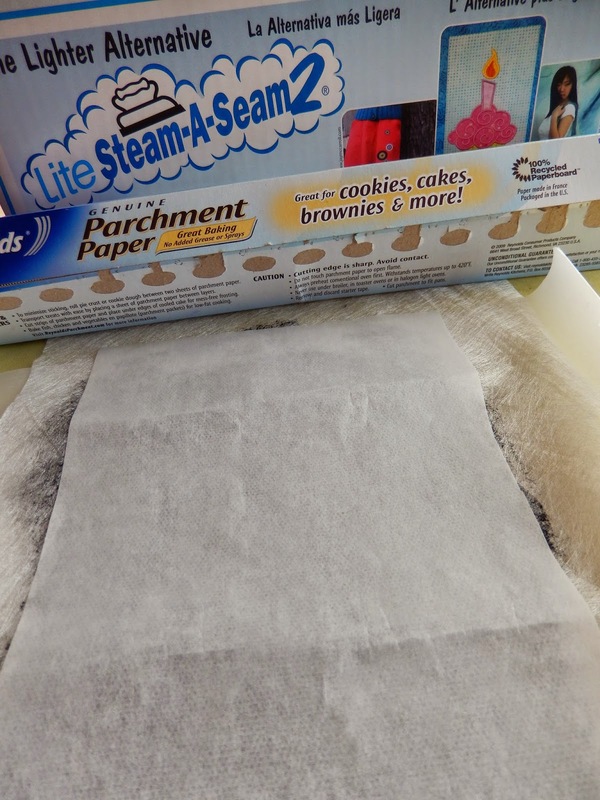 Sandwiching it between a sheet of parchment paper or a teflon pressing sheet protects my ironing board from melty paint when I apply Steam a Seam II Lite to one side of the Reemay. To transfer my desired design to the Reemay, I place white transfer paper on top of the Reemay with the waxy side facing down and trace the lines with a pen. Black and white clip art works nicely for pattern templates. After I have transferred my design, I remove the release paper from the Reemay and place the fused side down on a piece of glass. Make sure you have good ventilation, then trace around the white markings with a wood burning tool with the pointy tip attached. Peel up the design once it has been cut with the wood burring tool and place it on whatever fabric you want to show through the openings. Apply fusible to the wrong side of this fabric, leaving the paper attached. Then fuse your Reemay shape to the right side. Remember to protect your iron with parchment paper or a teflon pressing sheet. Do not touch your iron directly to the painted Reemay. Cut around the outside of the shape before removing the release paper from the fusible to fuse to your background. Use stabilizer on the wrong side of your background fabric as you machine appliqué around the outside of your Reemay shapes. That is a lot of little steps, but the results are lovely! To be honest, I hadn't either before I took the class at Art Quilt Santa Fe. I only wish it was more readily available. What a clever tutorial. I had never heard of Reemay. You creativity is amazing. So beautiful! It is available from bookbinding or conservation specialists. It is also known as frost cloth so try your garden centre.